'My work as a painter… is the condensation, the concentration of the hidden, but ever present, sadness that is in all people'. CLICK HERE to view an archival amateur video of the opening address of the Johannes Meintjes Prestige Memorial Exhibition at the University of Johannesburg (Rand Afrikaans University) on 7 June 1990. The 20-minute video starts after about 14 seconds and the address is primarily in English. The complete text in English may be viewed below. 'It is now forty-six years since that afternoon in the late winter of 1944 when Johannes Meintjes first exhibited in Johannesburg. What an extraordinary event that was! 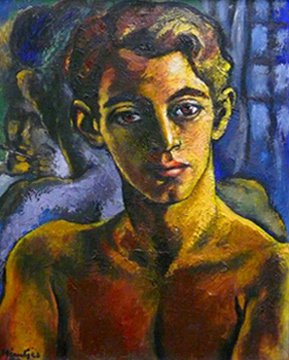 A young twenty year old Capetonian, trained since his fifteenth year by Florence Zerffi but finding himself in harmony with the German expressionism of Maggie Laubser and Irma Stern, an admirer and friend of Alexis Preller and Cecil Higgs, and claiming May Hillhouse as his greatest mentor and critic, and now exhibiting for the first time in the Gainsborough Galleries in Pritchard Street, by 1944 already the home of painters such as Alexis Preller and Walter Battiss and on opening days the gathering place of the city's avant-garde. 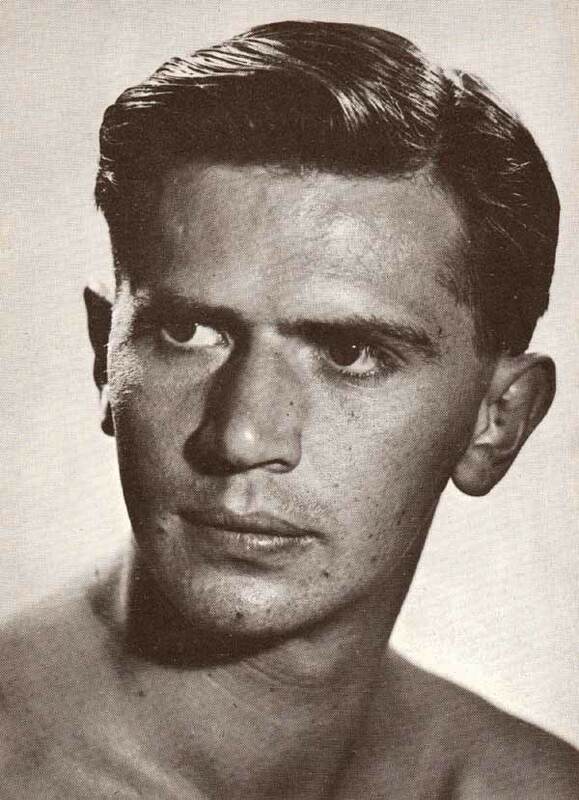 Meintjes was a handsome, slightly built young man, pleasant and communicative and yet with a brooding, withdrawn presence. 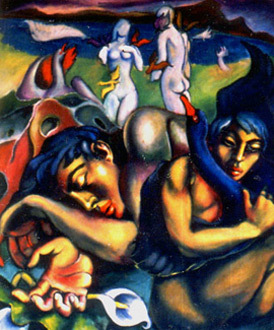 His paintings caused a sensation and impelled him into the front ranks of SA painters overnight. I have often wondered, looking back, what it was in those strange, enigmatic and extraordinary canvases that spoke so powerfully to us. Perhaps because it was the year 1944 when we had been subjected to the horrors of war so long… to death, to mutilation, persecution and hate. On that afternoon we found ourselves in the presence of a poetic vision of life, of love, of innocence and idealism. The paintings mirrored the painter: the sensitive mouth, the suggestion of hidden pain in the eyes, the reaching out to communion with all that was beautiful in life. But of course it was more than that. It was the bold, daring, sweeping use of colour; it was the sheer vitality and drama and reckless imagination; it was the form and composition of bodies that no other painter had ever attempted; it was the richness of textures… the evocative placement of figures in the landscape. 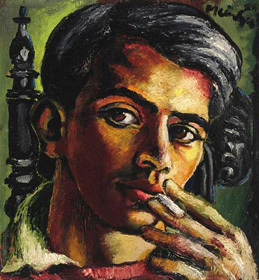 It was Johannes Meintjes' own individual expression of expressionism. Throughout his career as painter he remained true to his own personal vision. His critics were to accuse him of never having developed beyond the romantic nature of his youthful work. A strange accusation. Did we ask that Marc Chagall should move away from his vision of bodies floating in the sky? Or was it necessary that Dostoevsky should change his vision of Russian people between Crime and Punishment and The Brothers Karamazov? Did the deeper part of the poet in Goethe or Shakespeare manifest itself differently with the passing years? A rose is a rose is a rose as Gertrude Stein once wisely remarked. 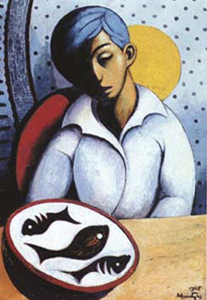 Meintjes placed his vision of life on the canvasses he painted at the beginning of his career and it was there in the last brushstrokes at the end of his life. In an interview in 1963 he himself stated '[The artist] needs to remain faithful to his vision, to his own idiom… and needs to preserve his integrity, develop spiritually, and work from the heart. This is what I have always been doing and will hopefully keep on doing so until my death'. His paintings grew richer in texture, clearer and firmer in composition, broader in the scope of subject matter. 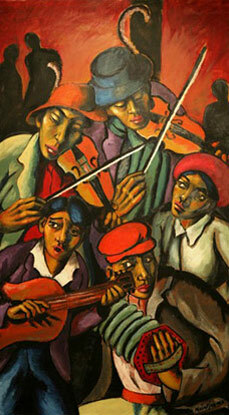 He was and remained the Orpheus of the South African world of painting. He was the singer-poet, the lyricist, like Orpheus a lonely figure wandering through the dark underworld labyrinths of man's spirit in search of his Eurydice whom he found but was never to touch or possess. The longing and the loneliness never left him and he expressed it in his own poetic terms. Already in 1947 a critic wrote of him that his brush lives and moves in an interrealm between the world of fact and fiction… His point of departure the inner world: an idea rather than external events engendering the spark of his creation… Yes, his landscape was and remained that of the secret labyrinths of man's emotions… a realism above and beyond the real. 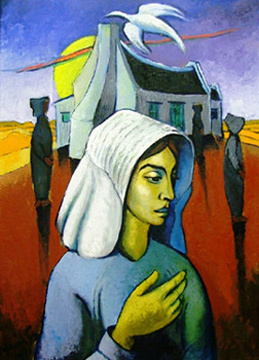 The artist Anna Vorster (1928 - 1990) was aware of it when she wrote 'The interesting quality in Meintjes' work is that his surrealism reflects an unmistakable South African atmosphere'. But Meintjes was not only a painter. He was also an author. 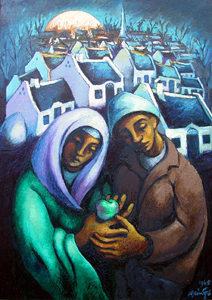 Since obtaining a BA-degree in his early twenties at the University of Cape Town, his talents as an author accompanied his talents as a painter. During that early stage his first book, a monograph on Maggie Laubser, was published. Tertius Myburgh (the editor of The Star at the time) recently referred to Meintjes as a 'Renaissance Man'. Indeed. Since his earliest years Meintjes insatiably embraced the world of culture. He consumed all the great literary works available in English, French, Afrikaans and Dutch. He writes articles and broadcasts for radio, and lectures in both art and drama. During his first visit to London, Paris and Amsterdam, he completely immersed himself in European painting, sculpture and theatre, and broadcasts together with composer Arnold Van Wyk for the BBC. Two years after his return to South Africa, he withdraws to the isolated family farm Grootzeekoegat. A magical and mysterious word in the life of Johannes Meintjes. The Meintjes family acquired the homestead, built in 1824 as home as well as fortress against the Xhosa nation during frontier wars, in 1859. Here three preceding generations farmed with sheep and this is where his father died when Meintjes was only five years of age. The family had little choice but to move away to Riversdal. For more than twenty years Meintjes had been dreaming about his return to Grootzeekoegat, to claim his inheritance and to reunite with his past. Here he would give expression to himself as a painter, write all his important manuscripts and build up his highly prestigious library. What strange mutations of the spirit moved through those generations of frontier families to bind Meintjes so inextricably to Grootzeekoegat and to spark the creative forces that drove him through his life? No visitor to Grootzeekoegat could escape the haunting atmosphere and sense of mystery that hung over these mountains… the legendary Storm- and Bamboesberge… and the aura of things unknown and unseen that pervaded the silent veld stretching out beyond the farmhouse. Once the sea had covered it; great forests have grown there and through the millennia it had been the home of wild animals and men. It was the scene of the great battles between frontier farmers and the Xhosa nation driven southwards by the warrior King Chaka. It is almost impossible to pinpoint it, but something of the primeval spirit of that place, of its timelessness, its loneliness and the deepest, most enduring and indestructible part of man is reflected in the canvasses painted by Meintjes. It was perhaps also the driving force behind so much of his writing… the need to give permanence to his own life and times in his diaries; his fascination with and reconstruction of times past… his bringing to life of Anton Anreith, of Olive Schreiner… the great historical figures of the Anglo-Boer War, amongst them his biography of General de la Rey, Lion of the West, that brought him world-wide recognition as an author. And his book Sandile, The Fall of the Xhosa Nation… the first major work on a black leader in South Africa. Together with his wife Ronell, whom he wed in 1960, Meintjes became part of the people of Molteno, the town closest to Grootzeekoegat. Here he was also appointed as the honorary curator of the George Vice Memorial Museum. Following his death the Johannes Meintjes Room was established at the Molteno High School in 1986, housing 74 works of art and the larger part of his prestigious and valuable Africana library. Johannes Meintjes died on the 7th of July 1980. 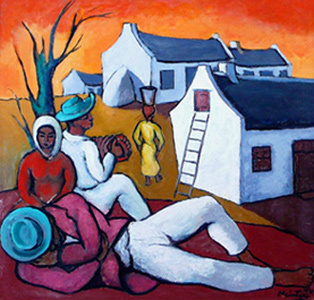 He had established himself as a major South African painter and writer. Apart from numerous articles and smaller works, he had published 35 books, amongst them an Afrikaans play that had won an important prize and a book on the Voortrekkers prescribed for students at Oxford University. 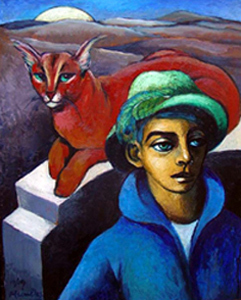 He had painted more than a thousand canvases and exhibited in all South Africa's major galleries, sometimes alone and sometimes in the company of artists such as Alexis Preller, Walter Battiss, Gerard Sekoto, JH Pierneef and Irma Stern. 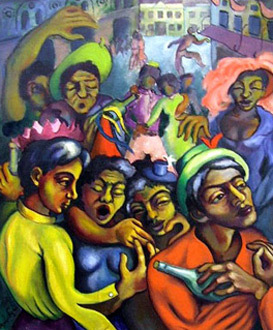 His canvases, painted with the knowledge born out of centuries of European experience, speak with the voice of Africa. He once said: 'Mine is the vision of a painter sprung from the soil of Africa and I have given it in a personal statement which may find a response in the heart and imagination of another generation'. Now we are moving into a new era in the history of our country. There is a No-man's land lying between the bearers of Europe and Africa's legacies. It is in that yet unexplored and unknown territory that they must meet and that history will be written. I feel that Johannes Meintjes is already part of that history: he has already entered that No-man's land. Looking again at his canvases, they reflect something of the naivety of the African artist… a dimension beyond the purely European - an expression of man's most basic being which is the foundation of great art. There is the timelessness of Africa, its dream quality, its loneliness, its primeval being; there is the poetry of moonlight on mysterious places and people, the sweeping juxtaposition of light and darkness. His work will grow in importance and remain an abiding influence and inspiration in a new South African era'.